It was not only George Washington who gave money, advice and assistance to various members of his extended family—see previous posts about Harriot Washington—but also his wife MARTHA WASHINGTON who did the same for her needy relatives. George Augustine Washington, the nephew of George Washington who was at that time living at Mount Vernon, soon became smitten with Fanny and the two married in 1785. They were invited, with their children, to make Mount Vernon their home; George Augustine managed the estate and Fanny took care of the household. Martha wrote to Fanny from the then capital of the United States, New York City, in 1789. * Tobias Lear was Washington’s friend and secretary. Martha sounds as if she would have preferred to be at Mount Vernon rather than New York. She is clearly uncomfortable as first lady. Indeed she did not journey northward for her husband’s inauguration but arrived later. Washington was finding his way in a new role and so was she. It took her some time to figure out how she should behave and what was expected of her. Sources: See Mount Vernon HERE and HERE. 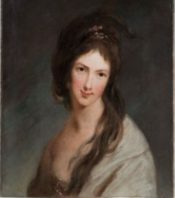 The portrait of Fanny was painted in 1785 by Robert Edge Pine and is at Mount Vernon. 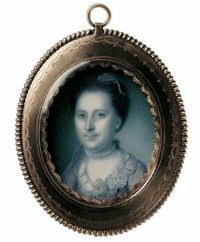 The miniature, watercolor on ivory, of Martha Washington is by Charles Willson Peale, 1772, and is held by the Mount Vernon Ladies’ Association.